More than ¼ of the world’s largest food companies now measure food loss and waste in their operations. The Food Waste Atlas, the world’s first freely accessible online tool to bring global food loss and waste data together in one place, launched. This will make it simpler to measure and track food loss and waste in a consistent manner, benchmark performance, identify “hotspots” and support the delivery of SDG 12.3. The African Union Commission announced its landmark “Continental Post Harvest Management Strategy” to help all 55 African Union member states implement policies, programs, and investments to address postharvest food losses at various levels of the food supply chain. Overall, the report finds that momentum is growing and progress in 2018 is promising, but much more needs to be done if this important target is to be met by 2030. The food loss and waste challenge is monumental and it is urgent. One-third of the world’s food is lost or wasted, costing the global economy $940 billion every year and emitting 8 percent of annual greenhouse gases. At the same time, more than 800 million people do not have enough to eat. To meet Target 12.3 in the remaining 12 short years, leaders across government and the private sector need to accelerate efforts to meet the scale of the challenge. 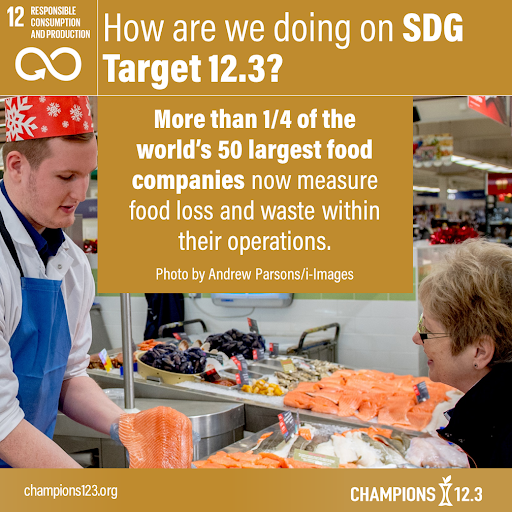 Following Champions 12.3’s approach of setting reduction targets, “measuring to manage” food loss and waste, and taking action can put the world on the path to success.